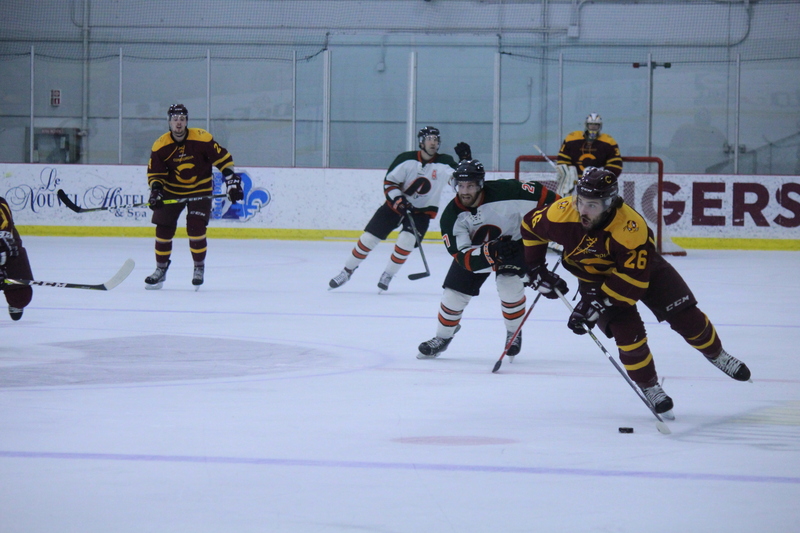 The Concordia Stingers men’s hockey team defeated the Université de Québec à Trois-Rivières Patriotes by a score of 6-3 on Oct. 21 at the Ed Meagher arena thanks to a complete team effort. The scoring started just 42 seconds into the game when Stingers captain Olivier Hinse scored to give the Stingers a 1-0 lead. Oke and Stingers defenseman Matthieu Desautels demonstrated great passing on the play in order to get Hinse the goal. Following Hinse’s lead, the Stingers were able to score three goals on the first five shots of the game. Stingers forward Charles Guèvremont scored at the two minutes 46 seconds mark of the first period thanks to a pass from forward Antoine Masson. Exactly three minutes later, Stingers forward Julien Rainville-Avon gave the Stingers the 3-0 lead. Despite being down by three, the Patriotes did not give up easily. Their first goal came with just under two minutes left in first period, thanks to a powerplay goal by defenseman Martin Lefebvre. Just one minute and 30 seconds into the second period, Patriotes forward Marc-Olivier Mimar scored off of a rebound to bring the score to 3-2. The Stingers regained their composure late in the second period as forward Dominic Beauchemin scored on the powerplay. The Stingers have improved their record to 4-1 on the season. The Stingers held off the Patriotes for the majority of the third period. With six minutes left in the game, the Patriotes scored on the powerplay to bring the score to 4-3. Just three minutes later, the Stingers replied with a goal from Oke. Just over a minute later, with the Patriotes goalie pulled, Hinse scored an empty-net goal to bring the score to 6-3. Despite not scoring, one notable player for the Stingers was forward Philippe Sanche. Sanche was all over the ice all game, working hard in the corners and on the forecheck. The addition of Sanche to the lineup has made a big impact both on and off the ice for the Stingers, and his coach isn’t shying away from that fact. The Stingers now hold a record of 4-1 and sit in second place in the east division. The team’s next game will be at home against Lakehead University on Oct. 28 at 7:30 p.m.